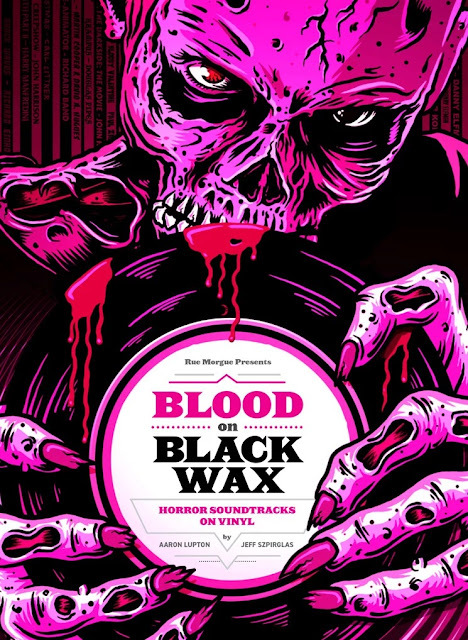 Rue Morgue and 1984 Publishing are proud to announce the release of BLOOD ON BLACK WAX, a book-length look at the unique history and artwork of horror movie soundtracks. Are you obsessed with John Carpenter's iconic music for the Halloween series? Do you thrill to the unforgettable stabs of the Psycho score, or the pounding synth of Goblin's soundtrack to Suspiria? Do you find yourself being pulled into the hair-raising modern scores for the likes of Get Out, Hereditary, and The Witch? You're not alone. BLOOD ON BLACK WAX is a full-colour, 204 page hardbound tome penned by RM Music Editor Aaron Lupton and contributor Jeff Szpirglas. This defining horror soundtrack volume spotlights iconic franchises such as A Nightmare on Elm Street, Friday the 13th, Jaws, The Exorcist, and George A. Romero's Dead films, highlighting both the music and the amazing, often rare artwork that graces the record sleeves. It also tells the stories behind the music, from the mouths of the musicians who made them, including John Carpenter, Fabio Frizzi, Christopher Young, Harry Manfredini, Charles Bernstein, Pino Donaggio, John Harrison, and more. On April 13 (Record Store Day), the book will debut as a limited signed edition featuring a 7-inch single of several rare and unreleased tracks from 1981’s Prom Night, composed and performed by Paul Zaza (My Bloody Valentine) and Carl Zittrer (Black Christmas). This release also features artwork by Ghoulish Gary Pullin and will be limited to 1000 copies. On May 13 there will be a wider release, featuring a 12-inch vinyl pressing of the classic Prom Night soundtrack cut at 45rpm. Collectors can choose from variants of "Bloody Disco Ball" (red splatter on metallic silver) and "Disco Acid Flashback" (tri-coloured royal blue/hot pink/blood red swirl). All versions will contain a gatefold sleeve and a "tuxedo black" branded Prom Night condom! BLOOD ON BLACK WAX also features a foreword by director Mick Garris (The Stand) and Afterword by composer Christopher Young (Hellraiser).